Following Saturday’s rather unexpected chase of the GTW Santa Train along the Mt. Clemens Subdivision, Sunday morning found two of the guys I’d run across in New Haven, a third guy and I heading west toward Owosso and the first run (on the last day of the season) of Steam Railroading Institute’s North Pole Express, pulled by Pere Marquette 1225. 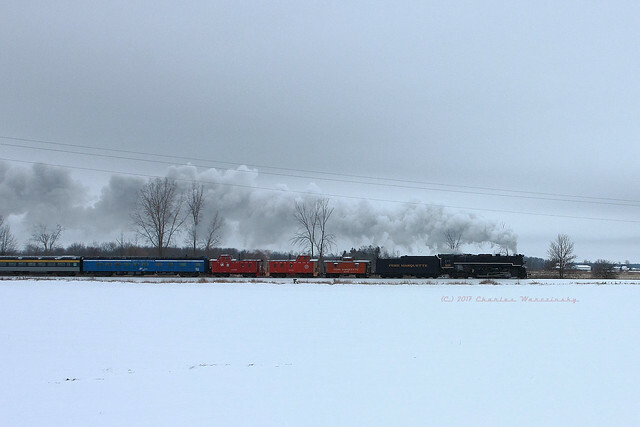 Having not attempted to chase the North Pole Express trains on snow covered roads before, it was a bit of a learning experience, as was finding places to stop where 4 guys could pile out of the car and set up to photograph and/or record the trains’ passage on video. But…in the end, we managed to watch the 1225 pass us twice before the train reached the “North Pole”. As the end of the train passed, I also snagged this shot of the guys I was chasing with. We wound up driving into Ashley (Michigan, the community just north of M-57, and the site of SRI’s “North Pole”). By the time we’d circled the town and found a parking spot, the train had arrived and was unloading passengers. We decided to eat before checking out the now-stationary 1225. I was sticking to cellphone photography at this point, and most of the pictures I took were with other people’s cameras. After lunch and candids with 1225, we headed south. 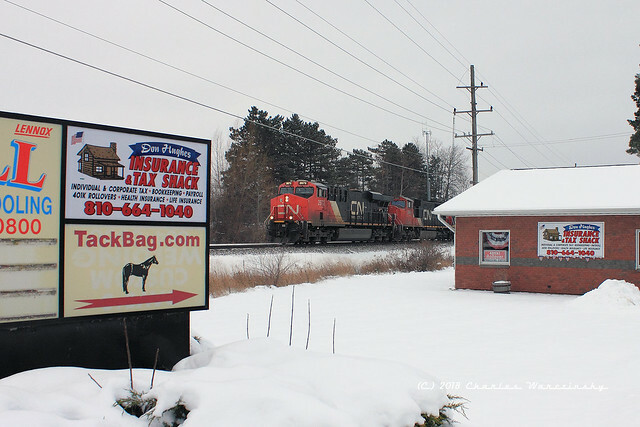 Our plan had been to see the 1225 and the GTW Santa Train on its trip to Battle Creek. By the time we wrapped up in Ashley, we were starting to cut things a little tight with our timing, but south and east we drove. Our plan was to catch the GTW Santa Train somewhere near Durand, although we weren’t exactly sure where. As we got closer and closer to Durand, we got word that something was approaching Paines (a junction a mile or two south of the diamond at Durand), and figured we probably couldn’t make Durand in time to see the train we wanted to see. So we diverted to Bancroft, which is a couple miles to the southwest of Durand. As we reached the Bancroft area, our hearts sank as we realized a westbound train was passing over the crossing in the distance. Until we realized that we were looking at autoracks. 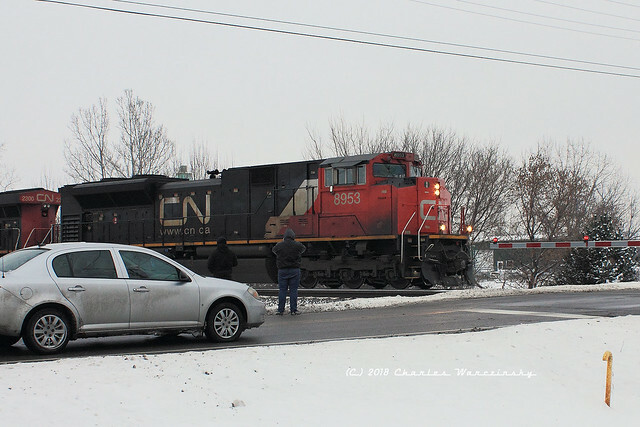 There were no autoracks in the Santa Train, which meant CN had run some sort of freight train in front of the speed restricted Santa Train, and we had still had time to find a spot to set up at. As it turned out, we would have had plenty of time to make it to the bridge near Durand that we had strongly considered shooting from. I found out later that afternoon that we weren’t the only ones who thought about shooting there, as some friends from the other side of the state started posting their own photos/videos from that bridge. In the end, we were the only ones in Bancroft (that I’m aware of) and only had to worry about staying out of each others’ shots. Following the passage of the Santa Train, we headed into Durand and spent a few minutes at the station. Before long, another freight train approached Durand from the west, and blew on through town. 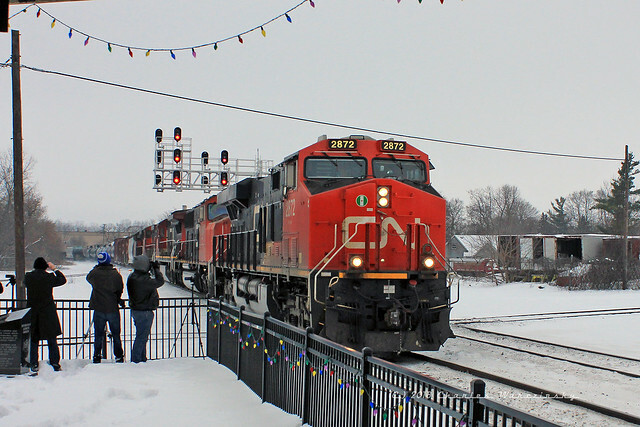 Even though the Santa Train was close to Lansing by this point, there was still a small photo line waiting to record the passage of the train. And with 5 locomotives, it was quite a train to record! Once the eastbound had cleared, after a couple minutes debate (ok, ok- as of the writing of this entry, it’s been almost a month since we chased these trains- the details are getting pretty hazy at this point), we decided to chase the train back towards home. After some idiotic decisions by the driver (yours truly), we wound up set up at Lake Nepessing Road, on the west side of Lapeer, as the eastbound freight approached Lapeer. A westbound freight train had taken the siding at Lapeer and would depart after the eastbound passed. After the westbound train and the traffic it had backed up at the crossing had cleared, we departed for home. I know we didn’t try for a 3rd view of the 2872 and train, but I’m pretty sure we beat them back to West Tappan (west end of the double track at Port Huron), by at least a couple minutes or so. All in all, despite the temperatures and the clouds, it was a fun day.